A crazy, insane woman with sword through head. Bits of brain still left, but not much good. 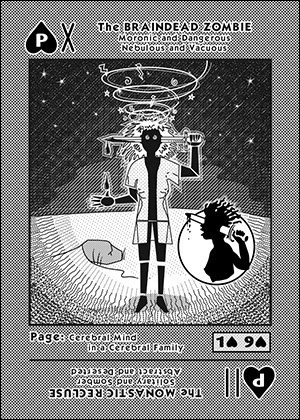 A Cerebral Mind in a Cerebral Family. Braindead, because, like the 1 of [ / ] she is a nebulous presence void of thought. Zombie, because, like the 9 of [ / ] she is damned to hell. Moronic, because, like the 1 of [ / ] her head is full of inanity. Dangerous, because, like the 9 of [ / ] she brings doom.